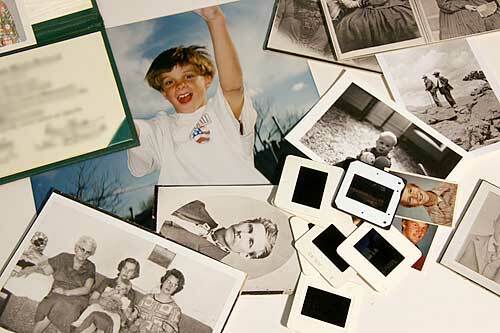 Slides and prints are first scanned on a high end scanner at the proper resolution. Using a high end scanner is important since they allow the user to capture the whole dynamic range of the prints and slides, we use an Agfa Duoscan HD for this reason. The resulting images are then cleaned, sharpened, and color corrected. We then lay the images out in a video timeline using a digital video program (Final Cut Pro). There we put them in the order that you specify, add transitions, music or your audio. If you send audio, you can also specify the timing of the pictures to the audio for just the look and sound that you desire. We then bring it all together on a video tape or DVD for you. You can send audio on CDs and/or audio cassettes, music, even your own commentary can be added for that special touch. Received my new DVD's and tapes. Thank you so much!!! I can't believe how fast you processed them! I had hoped to be able to take the DVD's to my parents, but didn't think you all would have them done in time. Yippee!! Great service and the DVDs are well done. Will definitely use your company again and recommend you to others!